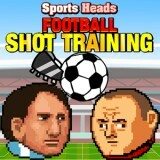 Try to do everything right and become the real winner of this cool football shooting game. Well, here you must hit all the targets and you will really set the best record. Are you ready for that? Then do not waste your time and move forward.